SVAI Review 2019: Is SVAI a Good Hosting? SVAI is a web hosting company based in Ukraine. It was founded in 2004, has its servers in Ukraine and offers both shared web hosting and VPS solutions. SVAI is a Ukraine-based web hosting company with data centers located in Ukraine. It has been in the web hosting industry since 2004. The vendor’s hosting-related services include shared hosting, domain registration, VPS, and SSL certificates. The hosting provider targets individuals and businesses in Ukraine and other countries throughout Europe. The SVAI website is only available in Ukrainian. SVAI VPS hosting uses KVM virtualization technology operated on both Linux and Windows operating systems. This KMV hardware-based technology enables the vendor’s virtual servers to, among other things, use their own cores and modifications, independent resources, and network card emulation. The VPS packages include a feature that allows users to install control panels such as DirectAdmin, cPanel, and ISPmanager. SVAI performs automatic website backups. They store all backup files in their own facilities instead of the customer’s allocated disk space so that they can have more space for day-to-day use on their websites. They retain each day’s copy of the website for 30 days. Additionally, following the end of a customer’s paid period, SVAI stores all of their website files for a period of 30 days, after which the backup files are deleted. The SSL certificate packages include RapidSSL Standard, GeoTrust QuickSSL Premium, Thawte SSL 123, RapidSSL Wildcard, Comodo PositiveSSL, and Comodo Positive SSL Wildcard. These SSL certificates support 256-bit encryption and are compatible with more than 99% of all known browsers and mobile devices. The SVAI website is loaded with information regarding the vendor’s different hosting packages. It’s also user-friendly and easy to navigate, even for novice webmasters. SVAI provides some of the cheapest hosting packages you’ll find in the market. What’s more, each of their cheap hosting plans is packed with above average features. Customers who choose the their annual or biennial billing cycles get as much as a 25% discount. 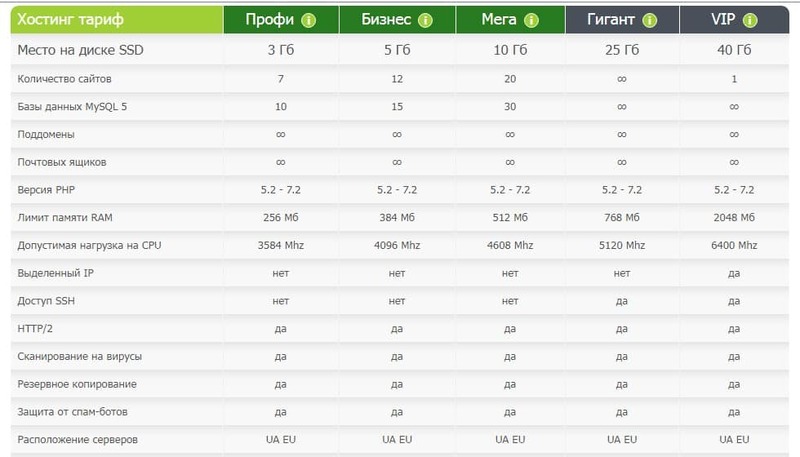 The prices of SVAI’s hosting plans are listed on their website in four currencies: Ukrainian hryvnia, dollars, euros, and Russian ruble. They do not have a refund policy nor do they provide an uptime network guarantee. For queries about SVAI’s hosting plans, you can contact them via telephone or email. For more technical issues, customers can open a ticket. They don’t have a live chat on their website. Their support team is professional and polite with a quick response time. For customers who prefer solving the hosting issues they encounter on their own, they have a knowledge base that includes helpful tutorials and blogs. That said, the knowledge base is quite limited and might not be of a lot of help to webmasters looking to answer more complex hosting-related issues. With over ten years of experience in the web hosting industry, it’s quite clear that SVAI has what it takes to provide hosting solutions to individuals and businesses in Ukraine and other countries across Europe. Their cheap plans and an array of above average features makes their hosting solutions suitable for startups and SMEs. Wondering how SVAI stacks up against other Web Hosting companies? Enter any other Web Hosting company and we will give you a side-by-side comparison.